The Lightbox's major Cyril Mann retrospective has been reviewed by Daisy Dunn in The Spectator. The exhibition, Cyril Mann: Painter of Light and Shadow, opened on 12 January. The show follows on from Piano Nobile's recent exhibition, Cyril Mann: The Solid Shadow Paintings. 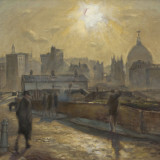 In her article, Dunn wrote that Mann's cityscapes 'glow with the promise of a brighter day'. Cyril Mann: Painter of Light and Shadow closes on 31 March 2019.